What Does My Unclaimed “Google My Business” Listing Say about My Practice? Making sure that your practice has an online presence is key to its growth and success in this modern age of digital marketing. However, the competition for page clicks has become so fierce that simply throwing your hat in the ring by setting up a company website is not enough. 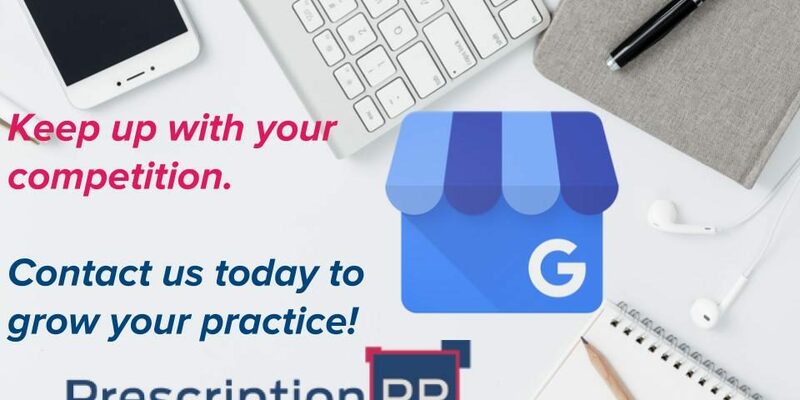 If you really want the online search community to take notice of your services, we at Prescription PR strongly recommend claiming your own Google My Business (GMB) listing as soon as possible. How Would A Claimed “Google My Business” Listing Help My Practice? Keep your website current – Maintaining your website with accurate street address information and an up-to-date list of services is vital to your practice appearing at the top of both consumer proximity, and keyword search results. A website that has not been updated with fresh original content will eventually lose its stature over time. Remain actively engaged with your audience – One of the factors that Google takes into consideration when deciding whether or not to give your practice a top spot on the search results page is its overall prominence and popularity. Making your website a destination for fresh and interesting on-brand content that can be shared across all social media platforms, as well as a place where users feel free to share their experiences while knowing that you will respond appropriately to any comments or concerns they may have, is important for showing Google that your practice is relevant, and can deliver on whatever the potential customer might be looking for. A few short years ago, it might have seemed like going the extra mile to have a claimed Google My Business listing. Today, however, it is a necessary tool for showing the crowded consumer marketplace that you care about how your practice is perceived. You want to be seen as a verified, reliable source for good information and above-satisfactory results. You want to put in the work to appear at the top of any given keyword search result. You deserve to build your practice to the best it can be, and we want to help you do it! Contact us for help setting up, claiming, or strengthening your Google My Business listing today.